We were already used to seeing Baptiste Giabiconi’s de-personalized self impersonating Karl Lagerfeld. Were we ready to see Coco Rocha as Karl Lagerfeld? 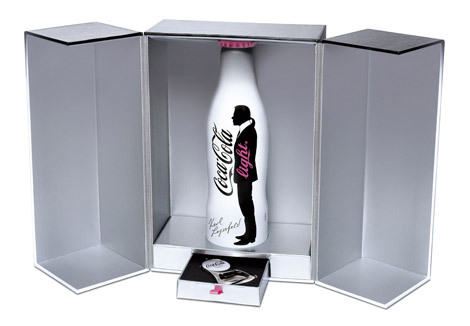 Karl designed the bottle with his iconic silhouette on the side and then dressed me as the femme version of him. I remember at one point in the shoot Karl didn’t think I had on the right accessories so he stopped the shoot and headed home to bring me a pair of his own gloves and then took off his tie pin and rings for me to wear! Nifty bottle and ad. I like it! Creepy – very creepy. 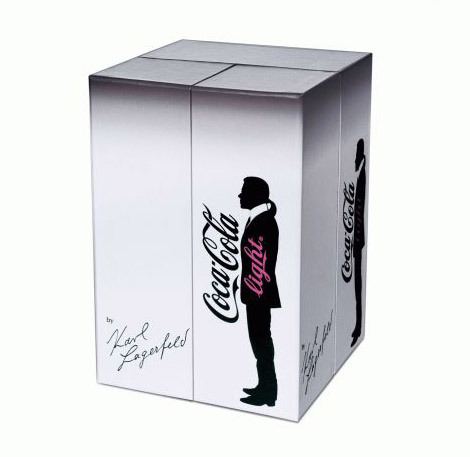 I like Karl as a person – I really enjoyed watching Lagerfeld Confidential and he seems a thoughtful, honest guy – but his ponytailed silhouette on a coke bottle is not appetizing to me! Eeek! AWESOME!……as you look at it,it’s so yummy and refreshing!..very unique design of the bottle..